Clans are purely for social gatherings and can can accommodate up to 15 people. Anyone can create a Clan by talking to the Guild NPC. Once you have created a Clan you can invite other players by going up to them and using the clan invite option. Clans can also be disbanded at any time by opening the clan window. You cannot change the leadership of a Clan. Guilds are much larger and can accommodate up to 100 people. Guilds can also declare wars and take part in sieges. You can change the leadership of a Guild for the price of 20,000,000 guild funds if the leader has not been active for 30 days. To create a guild you will need 100,000 silver. Talk to a Guild Manager NPC to create a guild. If you already have a Clan you can upgrade it to a guild but it will require the same amount of silver. You will keep the clan name when you upgrade to a guild and you will need to assign a contract to each of your members. Guild names can have up to 10 characters and can not include swear words or special characters. Guilds start off with 80,000 silver in the guild bank. These funds can only be controlled by the guild leader and can not be used for personal use. To disband a guild, the guild must have no members. Images must be 60×60 pixels and .png files. To upload the the image put it in your “Documents/Black Desert” folder with the name “Gmark.png”. Next you will need to buy a guild emblem token from the Guild Manager NPC. This costs 100,000 silver. Once you have the token go to your guild window by pressing “G” and click “Apply Guild Emblem”. To invite another player to join your guild, go up to them and click the guild invitation interaction. To become a member of a guild, the player will need to sign a contract. You can also invite a member by clicking their name in the chat box if they are in the same channel. If a member is kicked from the guild while still under the contract, they will be paid three times the amount of their daily pay. If a member leaves the guild while still under the contract, they will have to pay the penalty fee as a cancellation charge. If the member cannot afford the fee, they will not be able to leave the guild. 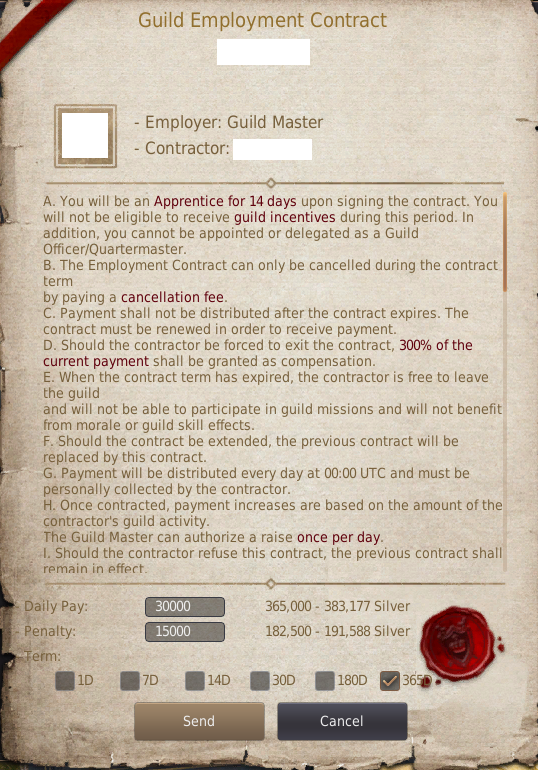 When a player is first recruited into a new guild, they are given the rank “Apprentice” and are unable to receive guild bonus payout (incentive). They are unable to be promoted during this time as well. After 14 days, the player will automatically be promoted to a General rank member. Once a contract runs out, the member is free to leave the guild with no penalty and the guild leader is free to kick the member with no penalty. You can only join a new guild 24 hours after leaving your last guild. Below are a list of all the standard guild contracts. Contracts can be renewed 24 hours after they were given by the guild leader or officers. Only the guild leader can renew officer contracts or quartermaster contracts. Contracts can also be upgraded over time to give up to a maximum of 5 million silver a day. This is done by increasing your guild activity and getting your contract renewed with a raise. If the guild does not have enough funds to pay a members daily pay, guild features will begin to disable and worsen as time goes on. Some features that will be disabled are: guild quests, contribution reward rates and member contracts. If the guild is also under siege, they will only be able to defend, they will not be able to attacking the opposing guild structures. When guild funds are negative, any of the guilds members as well as the leader can put silver into the guild bank. Members that are still under contract can also leave freely without having to pay the contract fee. Each Monday at 00:00 a support payment is also automatically given to the guild. The larger the guild size, the more welfare will be paid to the guild. However, guild welfare is only paid if there are more than 10 guild members are connected at the time of payment. 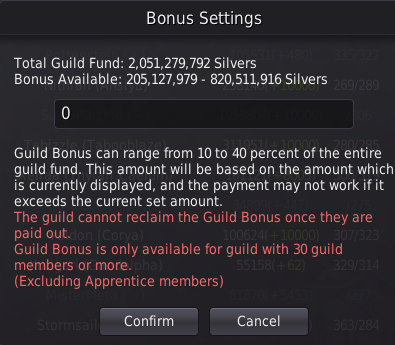 Guild Bonus Payout is only available for guilds with at least 30 members (excluding apprentice members). 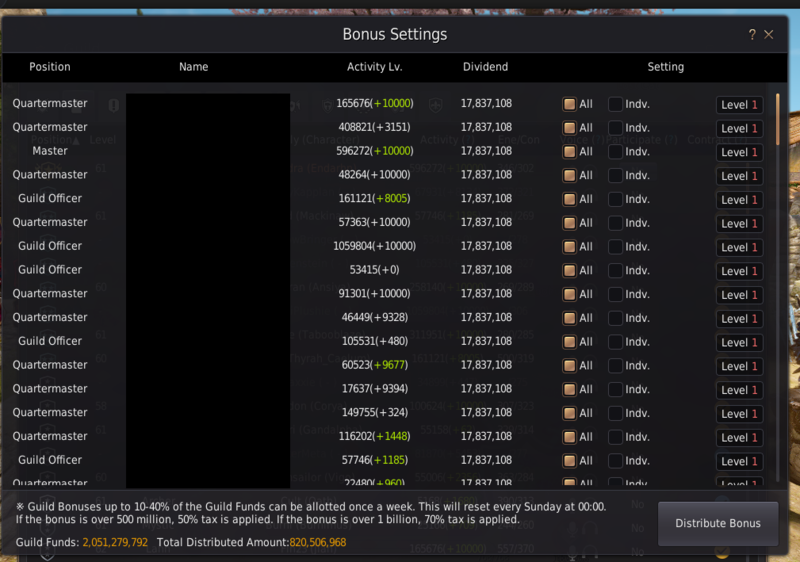 The Guild Bonus can be used weekly (resets every Sunday at 00:00) and must be between 10% – 40% of the total Guild Funds. If the bonus is over 500 million, then a 50% tax is applied. If the bonus is over 1 billion silver, a 70% tax is applied. Once you have selected your Bonus Payout, you can distribute it to members in your guild. Each member can be set a level between 1 and 10 and this is used to calculate the amount of silver each player receives. The higher level, the higher cut they receive out of the total bonus. All members (excluding apprentice members) will be paid. To gain guild activity, you must have an active contract. You will gain guild activity every time you contribute to your guild experience. This can be done by leveling up a profession, gaining contribution points or increasing your maximum energy. The fastest way to earn a lot of guild activity is by contributing to guild missions. In the Guild Member Status window, there are two numbers in white and green which indicate a members activity points in the guild. White numbers are your total activity and will carry across if you change guild but will be halved. Whilst the green number is the amount you have earned whilst under your current contract. The green number will reset every time you take a new contract. Each time you earn 100 activity points, you are able to earn a 1% raise for your next contract renewal (max 100% / 10,000 activity points). For example: If you are on a 7 day contract with 7,000 silver a day, and you earn 10,000 activity points, you can then be offered any other contract with a 100% raise, such as a 7 day contract with 14,000 silver a day, or a 30 day contract with 60,000 silver a day. These pots can only be used during Node War/Siege. It cannot be used during a Node War/Siege. Traps deal damage to enemies when they are stepped on. There are different types: Ankle, Flame, Stun, Venom. They can be installed around your fort. Three traps per person can be installed. When you step on the trap with an elephant, the rider will be thrown off. A fort/command post must be built to participate in Node War/Siege. There are different sized fort/command posts with diferent HP amounts: Square Fort, Strong Square Fort, Sturdy Square Fort, Sturdy Octagonal Fort. Can only be built before Node Wars/Siege. These can be placed around your fort/command post to help defend. Siege buildings include: Barricades, Supply Depot, Recovery Center, Hwacha, Flame Tower, etc. Guild Missions are quests that the Guild Master or Officers can select from the Guild Missions Menu. These quests will show up on the guild menu on the 3rd tab, which you can open by pressing “G”. The available quests will change every 10 minutes and are different on every channel. A guild can only take as many as 10 misisons a day and must be online to accept and complete them. You can only do one guild mission per channel at a time. The number of guild quests available to you depends on the size of the guild. Larger quests give more rewards and more guild exp/gold. The guild menu will give a description of the quest objective, the amount of time you have to complete the quest and the gold reward. Other rewards the guild will earn from guild quests include guild experience and guild boss scrolls. Guild experience is required to unlock guild skills. Guild members can also gain individual rewards by contributing towards a guild mission. Guild activity is earned to upgrade your guild contract, and you can also earn extra silver depending on your contribution to the mission. For the silver reward, you can obtain up to half of the silver of the guild funds set for guild mission rewards. The silver will be divided between all the guild members that participated. This silver reward is deducted from the Guild funds and can be collected using the “Collect Wage” button on the Guild Missions tab. Each time a guild member earns Contribution experience or completes a guild quest, the guild earns experience as well. When the guild levels up, the Guild Master can invest points into guild skills and unlock them. Guilds can own and fight over Nodes and Regions to control them and will earn silver for controlling a node. These are known as “Node Wars” or “Siege Wars”. To compete for a certain territory, a guild must build a siege tower inside the node territory. The Guild Master can buy the design for the tower at a Guild Manager NPC. The tower must then be built by workers using materials gathered by guild members. The winning guild of a Node War is the last to have their siege tower still standing. The guild will then receive the bonuses of controlling a node until the next Node War begins. Siege towers must be rebuilt, from scratch, for each Node War. To participate in a Node War/Seige, each member must change their “Participation” to Yes in the guild member list window. Afterwards, you can collect your reward by clicking “Collect Reward” at the bottom of the window. You will receive Shining Medal of Honor x1 – x5 depending on if you win the war or not. These can be exchanged for various items. If you have room in your guild for more members, you can hire “War Heroes” to fight for your guild during Node wars and conquest wars and receive rewards. For example, an Extra large guild that has 66 members can hire a maximum of 34 War Heroes. War Heroes are given a different contract that lasts until 24:00. The contract is automatically terminated and cannot be cancelled early. When you join as a War Hero, a certain percentage of the guild funds are given to you as a down payment (up to 10 million silver) when you leave the guild. If you win, a victory reward will be given as well (up to 20 million silver). If the territory is liberated or the guild did not participate in the warfare, the money will be return to the guild at 24:00. To declare war on another guild you will need 1,000,000 silver in the guild bank. You can declare war on up to 4 different guilds at the same time. If the guild doesn’t declare back, it will cost the declaring guild 300,000 silver every 2 hours of the war. Guild war information can be seen in the guild window by pressing “G”. Any guild can declare war at any time regardless of their members levels or guild points. Once you have declared war, both guilds can PvP each other freely in combat areas without karma penalties. The guild leader can cancel the war after a least an hour, by pressing the “Stop” button in the guild window. All members will automatically take part in the War. The guild master can select up to 10 members, using a guild skill (20 members at max guild skill), to be exempt from guild wars. If a member is declared as “exempt” this cannot be changed for at least 24 hours. The Guild Master and Guild Officers cannot be “exempt” from guild wars. Vacation status can now be given to a member of the guild. Members who are on Vacation will not receive any guild benefits and will not affect the number of guild members, but they are still in the guild. If you are on vacation, you cannot receive daily salary, participate in guild missions, declare war, recruite members, or kick members. You also cannot participate in Node/Siege wars or be a War hero. To go on Vacation or return, click the Vacation/Return button in the Guild Information window. At least 4 hours must pass after you click return to participate in a Node war/siege. If a War hero is taking your place, you cannot return until the contract expires as you will not have a spot in the guild. Train Elephants – Captured baby elephants can be raised, bred and trained at the guild house. Build Ships – You can craft a Galley Registration at some guild houses. Craft items – All members can use the guild house to craft items by pressing [L] to open the crafting window. Members can also send their workers to the guild house to work for the guild. Expand the guild warehouse storage – All members can use the guild warehouse storage inside the Guild House. If the guild loses the guild house, their progress and items will be saved. These items cannot be used by other guilds, but will be accessible again to you when your guild purchases a new guild house. The Galley is a guild ship which can be used by officers or the guild master. Galleys have 4 cannons on each side and can only be built at certain guild housing or by completing the quest [Guild] I have a Dream. You use [Guild] Cannon Ball for Ship to use the cannons on the ship, these are sold at a guild Wharf NPC. Unlike the other ships, the galley is repairable and you can also use workers on the ship for additional stats. Building Boat Lv. 1 – This skill will allow you to craft the ship registration. The skill costs 10 guild skill points. Building Boat Lv. 2 – This skill will allow you to craft blue grade ship parts. The skill costs 2 guild skill points. Fully Prepared – This skill will allow you to craft the item [Guild] Origin of Wind. The skill costs 5 guild skill points. [Guild] Clearance Permit x300 – A [Guild] Clearance Request must be crafted using the following materials, then exchanged at a Guild Manager NPC for a Clearance Permit. [Guild] Galley Plan x25 – Galley Plans are only available from Philaberto Falasi in Port Epheria in exchange for 1,000 amity. These are currently the only Guild houses that allow you to craft a galley. For more information on guild housing, click here to view our guide. The total guild funds required to buy all the materials is 205,930,000 silver. Therefore, I would recommend gathering as many materials as you can before bidding on a guild house. Once you have everything listed above, place the materials into the guild bank and go to the guild house crafting window by clicking on the guild house from you map. You can send a maximum of 200 workers to work on the ship at once. Only one ship can be crafted per day, with a total of three ships available per guild. Weight Limit: 4,000 LT Durability (HP): 1,000,000 Lifespan (Stamina/Power): 1,000,001 Cargo Load: 5 Acceleration: 100% Speed: 100% Turn: 100% Brake: 100% As mentioned in the introduction, the Galley can be repaired and it also has the “Power” stat, unlike other ships. It has HP which is repairable using Ship Repair Material, crafted by chopping Plywood (any) x2. Using this will recover 5,000 HP and it does not have a cooldown, but takes 30 seconds to apply the heal. If the boat’s HP reaches 0 it will disappear and can be recovered at the Wharf. It’s Lifespan (Stamina/Power) depletes when sailing, similar to other mounts such as horses. If the boat’s lifespan reaches 0 the boat will move significantly slower. You can use the [Guild] Breezy Crystal item, which is bought from guild Wharf NPCs, to recover 10% of the Max Power. This is instant but has a cooldown of 60 minutes. You can also craft a more powerful version of this item called the [Guild] Origin of Wind. This item recovers 50% of the Max Power and only has a 30 minute cooldown. The recipe is: [Guild] Breezy Crystal x2, [Guild] Sticky Glue x2, [Guild] Sea Monster’s Neidan x2. [Guild] Galley: Bronze Prow Statue – The Bronze Prow costs 7 million silver and will give your ship DP +10, Speed +1% and can be enhanced for an increase of DP +1, Speed +0.5% each time. [Guild] Galley: High Wind Sail – The High Wind Sail costs 6.5 million silver and will give your ship Max Power +1000, Turn +1% and can be enhanced for an increase of Max Power +200, Turn +0.2% each time. [Guild] Galley: Maria Cannon – The Maria Cannon costs 8 million silver and will give your ship AP +10, HP +1000 and can be enhanced for an increase of AP +1, HP +500 each time. [Guild] Galley: Enhanced Shield – The Enhanced Shield costs 8.5 million silver and will give your ship DP +10, Weight Limit +100 LT and can be enhanced for an increase of DP +1, Weight Limit +10 LT each time. [Guild] Galley: Steller’s Sea Eagle Prow – The Sea Eagle Prow will give your ship DP +20, Speed +2% and can be enhanced for an increase of DP +1, Speed +0.8% each time. [Guild] Galley: Cloud Breeze Sail – The Cloud Breeze Sail will give your ship Max Power +2000, Turn +2% and can be enhanced for an increase of Max Power +400, Turn +0.4% each time. [Guild] Galley: Sophia Cannon – The Sophia Cannon will give your ship AP +20, HP +5000 and can be enhanced for an increase of AP +1.5, HP +3000 each time. [Guild] Galley: Enhanced Blue Plating – The Enhanced Blue Plating will give your ship DP +20, Weight Limit +150 LT and can be enhanced for an increase of DP +1.5, Weight Limit +20 LT each time. To promote the workers, you will need 1000 Amity with Dichzy Borne at Lema Island. This will unlock the Sailor Promotion quests which you must complete to gain the skilled contracts, increasing the worker stats to +3%. You must also buy contract renewals from the Guild Wharf NPC to extend the length of your worker’s contract. You will need a certain level of sailing skill to use special skills on your sailboat. Skills also use up your ships power stat.